Sports are almost always in season, as baseball and soccer give way to football and hockey and then eventually to basketball. Columbus loves its sports, and there’s nothing better than gathering together to watch a game or two with good food and good company. Fortunately, local Columbus bars, pubs, and restaurants have you covered! Gallo’s Tap Room is a favorite tavern for beer, food, and sports. Sit under the giant antler chandelier while you watch your favorite teams, sample their giant tap list, and nosh on grilled chicken “slenders” or one of their specialty sandwiches. Newcomer Cray Eatery & Drinkery in the old Wonder Bread factory features a few TVs tuned to sporting events. Their easy-to-like menu of sliders and house-infused liquors is a great accompaniment to a little viewing. The slider menu is creative, with everything from duck, turkey, and buffalo chicken, to crab cake, mac & cheese, and vegetarian selections like quinoa and portabella mushroom. The R-Bar in the Arena District claims to be the #1 hockey bar in Ohio. A popular spot before, during, and after Bluejackets games, R-Bar offers a long happy hour on weekdays, with specials during the games themselves. The suspended jumbotron above the bar features more than two dozen screens. The menu of pizza, sandwiches, and burgers even includes some local snacks, like Brezel pretzels from North Market nearby. The Pint House in Short North is decorated with TVs on every wall, and the menu starts with easily shareable items like short rib nachos, fresh cut fries, and a reuben quesadilla. A weekly beer tap takeover features different breweries or compares favorite styles side-by-side. 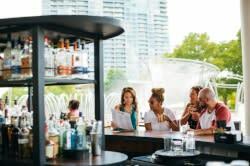 King Ave 5 serves the Grandview and Upper Arlington neighborhoods with generous happy hour prices, a huge menu, spacious seating, and over 30 screens brimming with sports action. Favorite sandwiches include the Shanghai chicken philly, the French dip, and the fish sandwich. The Crafty Pint in Linworth lets you enjoy their 40 taps of beer while taking in a game on one of their TVs. The beer selection is international, but there’s a big focus on Ohio brews like Columbus’ Seventh Son and Elevator, or state-wide drafts like Hoppin’ Frog, Jackie O’s, or Buckeye Lake Brewery. The beers are complemented by comfort foods like ale cheese soup, fired flat breads, and hand-crafted meatballs. 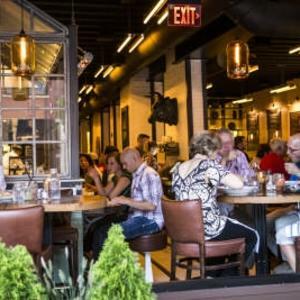 In the Brewery District, Westie’s Gastropub dishes up fun classics like potato pierogies or a maytag blue cheese burger to enjoy while taking in all the sports you could want on their TVs. Fans of the UK pub experience have plenty of options, too. For starters, Mac’s Café in Short North is a classic stop for scotch eggs, Guinness stew, and a pint of Newcastle. The Pub Polaris offers a cozy atmosphere with a British menu of bangers and mash or shepherd’s pie. Fado Irish Pub at Easton is a favorite Irish pub, with dedicated events for both types of football: the National Football League and the English Premier League. A pint of Guinness pairs nicely with a plate of house-cut chips or corned beef and cabbage. You can even take in some Sunday rugby while enjoying an Irish breakfast or braised lamb hash. Where’s your favorite place in Columbus for sports and snacks?